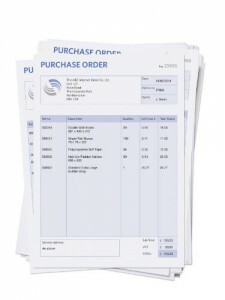 What’s the cost of raising a purchase order? Ask a dozen companies and you’re likely to get a dozen different answers. Setting aside major purchases, let’s focus on the everyday items of expenditure without which our factories and warehouses would soon grind to a halt. Ten years ago, a number of studies put the cost of raising a purchase order between £30 and £50. This took into account fixed overheads including accommodation, heating, lighting and staff; plus the variable costs of internal paperwork, phone calls, payment arrangements and postal charges. However, with the introduction of electronic purchasing and supply chain management software, the costs of processing a purchase order have now dramatically reduced. Various sources today put the average cost between £7 and £15. Linked to an automated business inventory, orders can now be raised and processed without human intervention. Stability and continuity of supply a vital factor in JIT manufacture and distribution. Stock/inventory cost reduction through prompt, reliable deliveries and consignment stocks. Reduced number of transactions speeding verification and payment processes. Reduced goods inwards and warehousing costs scheduled, consolidated deliveries avoid constant interruptions and work flow bottle-necks in your goods inwards department. Consistency of quality avoiding despatch delays and rework costs. A co-operative relationship, focussed on the purchaser’s needs; providing such benefits as enhanced technical support, a collaborative cost reduction process, practical advice and access to new industry developments. No surprise then that packaging supplies are high on the list when it comes to targeting areas for improved purchasing efficiency!